Darwin described the lack of transitional fossils as “the most obvious and gravest objection which can be urged against my theory”, but explained it by the extreme imperfection of the geological record.1 And so the hunt was on for intermediate forms which would demonstrate the transition between one species and another. Lyell used the term “missing link” in 1863,2 a common but inaccurate term, although still in popular use today. 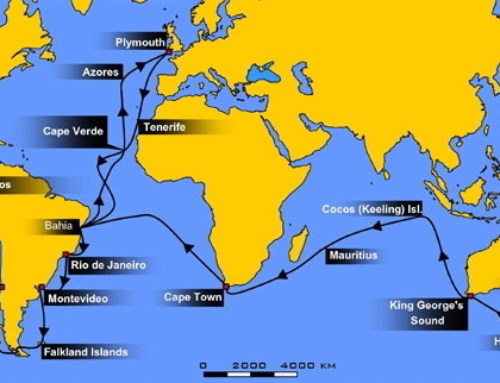 Here are the main discoveries of the 19th century that were used to support Darwin’s theory. Less than two years after the publication of The Origin of Species a bird-like fossil was discovered in the Jurassic limestone near Langenaltheim in Bavaria, southern Germany. 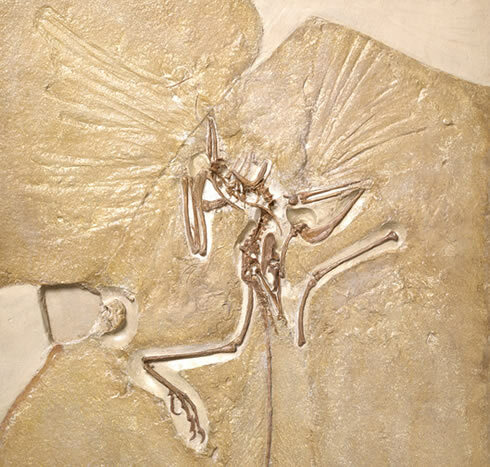 Named Archaeopteryx, it was feathered with wings but it had teeth, a lizard-like tail and claws at its wingtips. Thomas Huxley saw the fossil as a transitional bird having many reptilian features, linking it to the dinosaur. Other similar discoveries followed and this seemed to confirm Darwin’s theory of evolution and became a key piece of evidence in the transitional fossils debate. Two books on ancient man appeared in 1863. 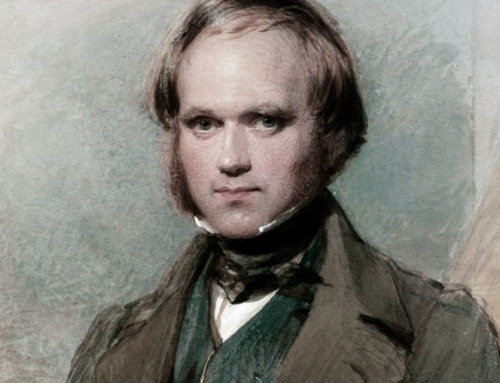 Charles Lyell’s volume on the antiquity of man2 considered the discoveries of Palaeolithic (Pleistocene) man but avoided a definitive statement on human evolution. 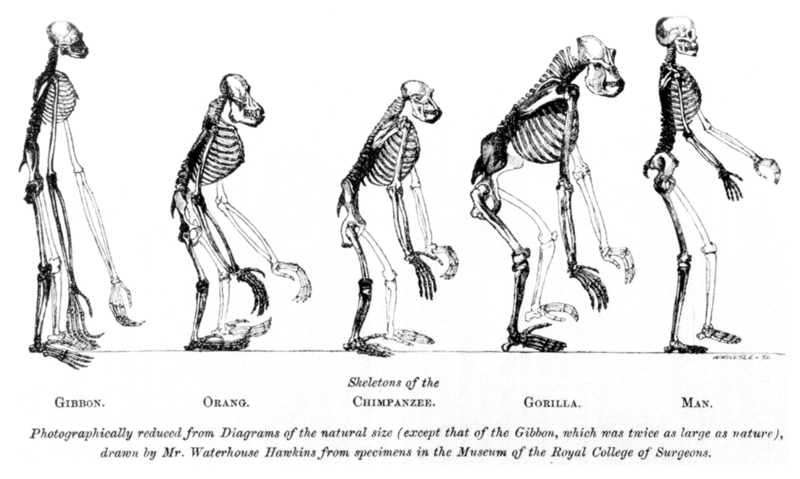 Thomas Huxley’s book,6 however, was about the evolution of man and apes from a common ancestor. The first discoveries of “Neanderthal man” had been made by the time of Huxley’s book. 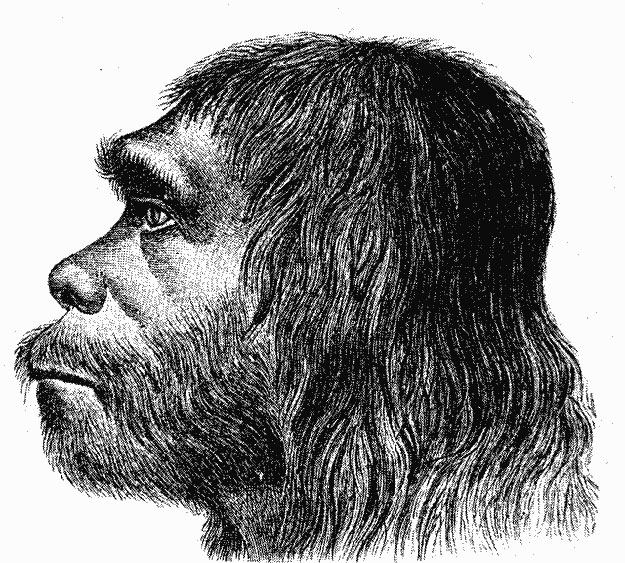 He regarded the skull as “the most brutal of all human skulls” but still that of a human being.7 His discussion therefore was based solely on contemporary embryological and anatomical evidence, arguing on structural grounds that man might have originated “by the gradual modification of a man-like ape”. Since Darwin’s and Huxley’s publications a number of human-like and ape-like fossils have been discovered. Much of the material is fragmentary and views differ on any evolutionary path that might be interpreted from it. New discoveries tend to challenge previous interpretations10 while fossils considered human have been re-identified as ape; recent examples of this include the Longgupo jaw, originally called Wushan Man, from China11 or Ardipithecus ramidus from Ethiopia.12 At a molecular level the DNA sequences of humans and chimpanzees are reported to be 96% similar.13However this disguises the 40 million individual differences at the nucleotide level,14 the different number and structure of chromosomes and the gene gain and loss which, as Demuth et al state, ‘represents a large number of genetic differences separating humans from our closest relatives’.15 Darwinian evolution of man and apes from a common ancestor remains unproven. The assumption that embryo development replayed an evolutionary ancestry dates to the later eighteenth century. Darwin developed the idea as important evidence of evolution in The Origin of Species and illustrated human and dog embryos in his The Descent of Man16. 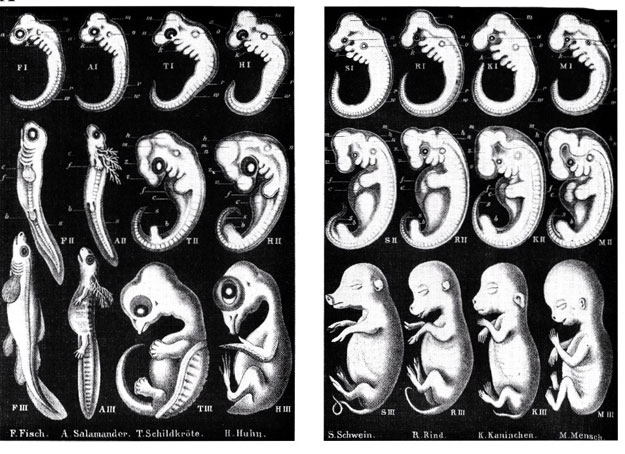 He noted analogous drawings had already been published by Ernst Haeckel 17 who developed the idea of “ontogeny recapitulates phylogeny” in a subsequent book.18 Haeckel’s illustration of the embryos of different animals became a common illustration in biology text books outside of Germany although it had been exposed as fraudulent there at the time. 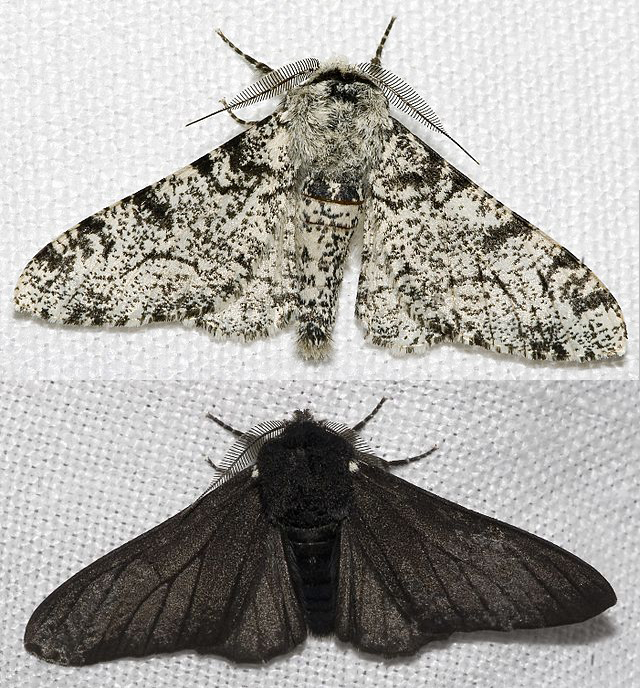 The Peppered Moth provides an excellent example of the impact of a changing environment and bird predation as agents of natural selection. Other examples interpreted as natural selection occur in both the contemporary world as well as the fossil record, some of the latter leading to extinction. But it is not possible from this evidence to extrapolate a Darwinian theory of evolution involving changing body plans or a common ancestor to all life. 3 Alonso, P D et al (2004) ‘The avian nature of the brain and inner ear of Archaeopteryx’ Nature 430, 666-669. 5 Quick, Devon E et al (2009) ‘Cardio-pulmonary anatomy in theropod dinosaurs: Implications from extant archosaurs’, Journal of Morphology, Published Online: 20 May 2009. <http://www3.interscience.wiley.com/journal/122395783/abstract> accessed 23 May 2013. 8 Schaaffhausen H (1888) Der Neanderthaler Fund, Marcus, Bonn. 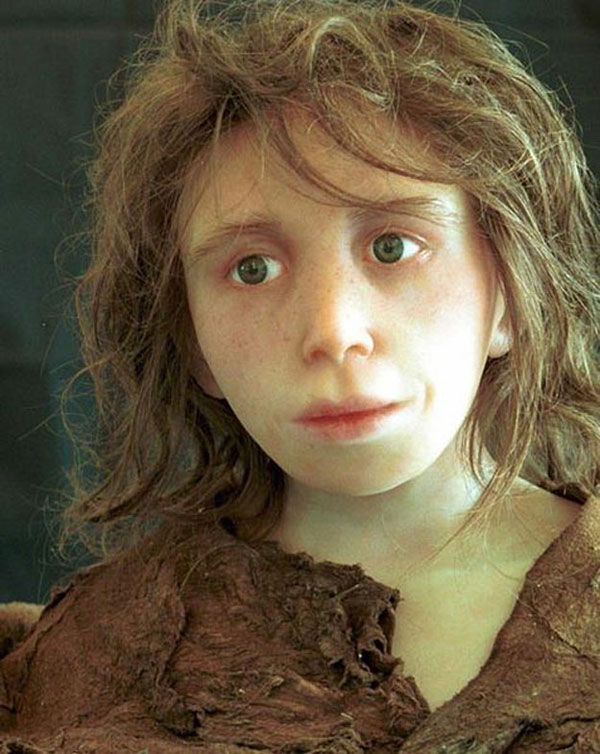 9 Schmitz, Ralf W et al (2002) ‘The Neandertal type site revisited: Interdisciplinary investigations of skeletal remains from the Neander Valley, Germany’, PNAS, 99(20) (1 October 2002): 13342–13347. Published online 13 September 2002. 19 Gould, Stephen Jay (2000) ‘Abscheulich! – Atrocious! – the precursor to the theory of natural selection’, Natural History, March 2000, American Museum of Natural History, New York. 21 Majerus, Michael (2007) ‘The Peppered moth: the proof of Darwinian evolution’, European Society for Evolutionary Biology Congress Abstracts, 6, Uppsala, Sweden.